When planting up a garden careful thought needs to be given as to how things will look in the winter. All too often, too much emphasis is given to summer interest planting, without any thought to the garden in the winter months. If the garden is planted without any structure, colour or form then come winter all that is going to be on view is the boundary. For these months when very little flowers, think bark, berries and foliage to provide interest and attention. Just when garden centres should be capitalising on this season for selling winter interest plants, they have cleared the decks and all that is to be found are Christmas trees, baubles, waving Santas and all that naff stuff (it’s no wonder garden centres are in decline). There are many plants to choose from . Grasses , shrubs & trees that will provide interest when everything else has gone into hibernation. Some I am sure you will be familiar with, some you may not be, some you may never have thought to use in a certain way. Over the the next few weeks I will make the time to post one plant a week and how I think you can use it in your garden to maximum effect. To kick things off I’m going to start with the first picture of this post. Every garden needs at least one tree for height and the Acer griseum is a fabulous tree for providing winter interest. 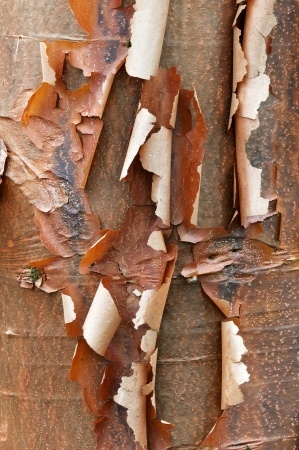 For obvious reasons, it is otherwise known as the ‘paper bark maple’. Not only does this tree provide a focal point in the winter with its wonderful coppery peeling bark, it also has a terrific Autumn leaf display. Acer griseum is a medium sized tree (eventually) but do not let this stop you purchasing one if you have a small garden. It is incredibly slow growing!! Consider highlighting the bark with a soft low voltage LED light. When planting in front , try not to cover up the bark with evergreen shrubs, instead try grasses perhaps or plants with a contrasting stem colour. Few plants provide the exceptional value and versatility as ornamental grasses in the garden. There are 10s of species and 100s of different varieties to choose from. Grasses that like dry soil, wet soil, tall grasses, short stumpy ground cover ones and grasses that will grow 10 feet in height or more. The real beauty however lies in their show stopping late Autumn and Winter flowers (depending on variety). These loose, feathery blooms look stunning in the sunshine and magical when covered in a hoar frost. If that isn’t enough the seed heads provide much needed food for winter foraging birds and the clumps of foliage, perfect for hibernating bug life. 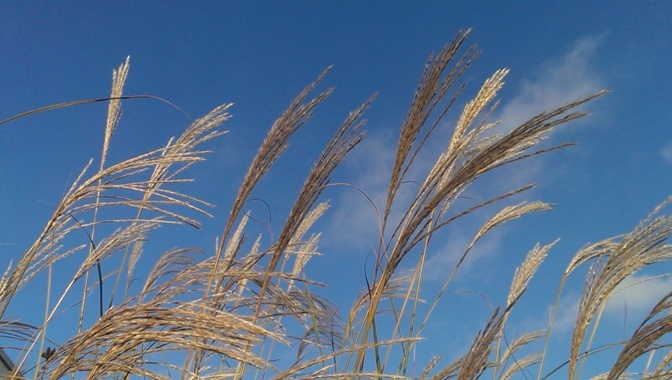 When designing with grasses consider Calamagrostis for creating ‘see through’ screens in the garden or varieties of Miscanthus to define areas with walls of tall foliage. 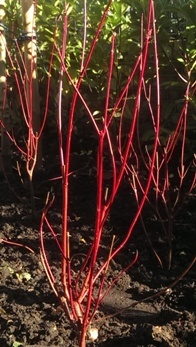 Planted en mass there is not much that can beat the stunning Winter display of stem colours as the Cornus species of shrubs. For me they steal the show in Winter when colour is lacking everywhere else. From orange to lime green, reds and even blacks there is a stem colour to suit most situations and planting schemes. The picture here is an area I recently planted in a front garden in Barnes. Within a couple of years this area will be a thicket of red in the winter. To further highlight the stem colour I have under planted with small sulphur yellow daffodils. I’m just hoping for snow this year as I know what that looks like (will be a treat for the client too). My tip for Cornus is plant in numbers for effect. Planting just one will not create any drama and possibly be lost all together amongst other planting. If you have a wall as a back drop choose a light green stemmed Cornus, something like Cornus sericea flaviramea. This will show up much better than the red variety. Being evergreen Phormiums are a great addition to any planting plan. The trouble with Phormiums is they are often mass planted in amenity planting and when they are planted by these thoughtless thugs they always seem to plant the variegated variety. 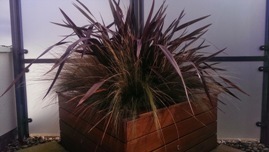 The one here in the picture is Phormium ‘Black Adder’ with very deep purple coloured foliage. This looks great planted around with almost any colourful herbaceous planting and Spring bulbs. Phormiums are almost a no maintenance plant. Just cut off any bedraggled stems and mulch in Spring. My tip for using Phormiums would be to plant around with a low Lavender for contrast or in a contrasting planter. Phormiums are also great when lit from the front onto a wall or fence as this throws up a stunning silhouette onto the back drop. 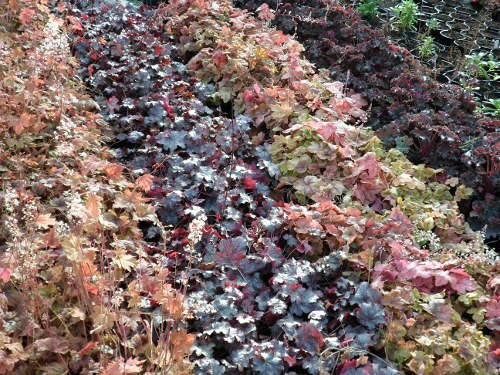 Heucheras are great at proving foliage colour for Winter interest. With colours ranging from a livid lime green to deep purples there is a foliage colour to suit all planting schemes. The flowers on Heucheras are sprays of delicate white flowers on single stems. Use them at the front of the border as the foliage grows quite low to the ground. Consider planting with ferns and Hellebores for a truly magical winter border display. The Heucheras displayed are, from left to right: Heuchera Sweet Tea, Heuchera Amethyst Mist, Heuchera Redstone Falls and Heuchera Purple Petticoat.